I am painfully aware of my tendency to wax lyrical about how much I love autumn. What can I say? This season of changing hues, dappled light and cold sunshine is just so special. I'm a creature of habit and September marks the start of the school year (a ridiculous justification I know, given that I am now 25 and my school days are little more than an increasingly foggy blur of anxiety and bad hair days). I'm an October baby and - despite nursing a futile fear of getting older - the child within me does still rather look forward to all the excitement and attention that birthdays bring. Autumn also sees the hedgerows weigh heavy with produce, which ignites new ideas and brings new recipes to my kitchen every year. I can wear my favourite thick jumpers and cashmere socks without bursting into flames and, at the risk of losing readers for jumping the gun a little here, the C word starts to slip into day-to-day dialogue which fills me with that wonderfully warm feeling of the familiar and the delicious. Yes, I went there - I can only apologise. On the subject of Christmas, I often get asked for gift recommendations for bakers. I am quite picky about baking-ware. I only want to have things in my kitchen which I like to look at. As I've grown older, I've consciously moved away from the pastel pinks, polka dots and bunting prints that you so often see used in baking designs. Instead, I am slowly building up a selection of ceramic tableware and good quality, beautifully designed cookware. Neither of these things come cheap, but I think it's worth playing the long game. And so, let me present my gift guide for bakers, which I'm delighted to be partnering with John Lewis to bring you! John Lewis is where my Mum bought our school shoes. It's where my granny bought my sewing machine, and the dress patterns which she used to teach me to sew. It's where I have bought all of my kitchenware, and where I seem to find myself when I've had a tough day and just want to feel happier. I can't put my finger on it, but John Lewis seems to do just that. John Lewis have an extensive baking range (take a look here), so are a good place to start when buying for bakers. I find that most shops seem to either have style or substance - John Lewis really does have both. 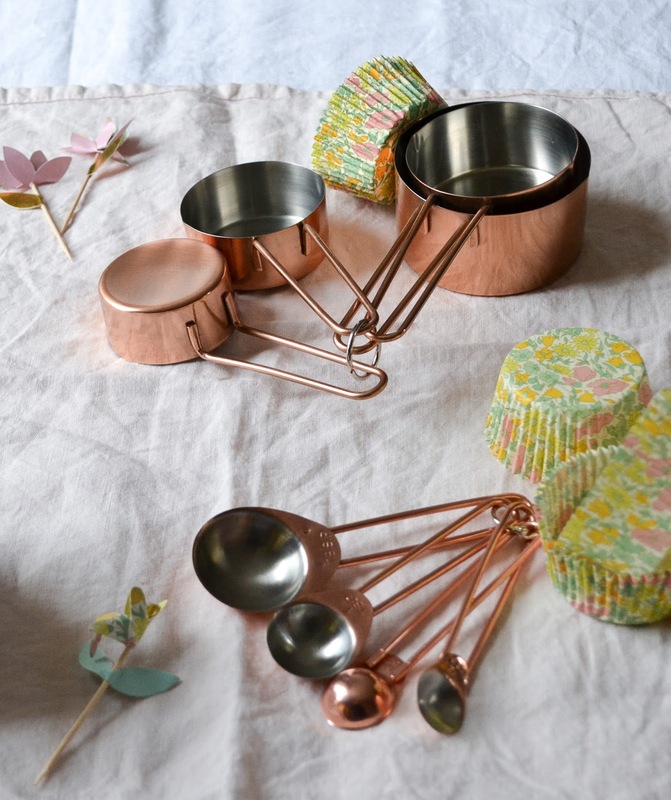 Copper has certainly had a renaissance in the kitchen. Copper and rose gold are two of my favourite tones in kitchenware - I love the peachy, warm notes they bring without being overly girly. These Craft Collection measuring spoons and measuring cups make a great practical present - and look picture perfect hanging from display rails or pegs in the kitchen. Perfect for stylish cake bakers. 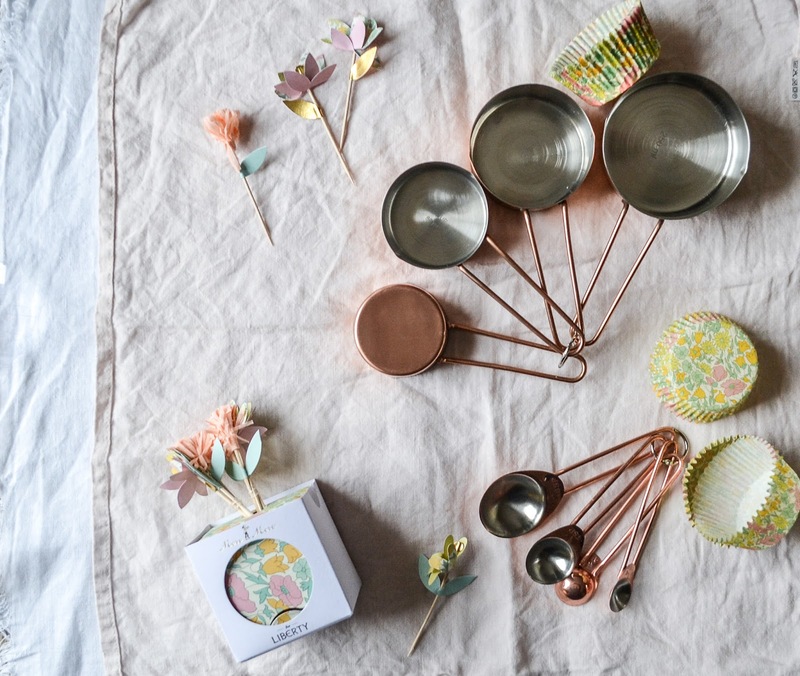 I am obsessed with the gorgeous range of cupcake cases, toppers and flags by Meri Meri. They are cute without being cutesy, which I find a delicate line to walk and one that few brands quite get right. The party pick toppers are playful yet stylish, the neon tones keep the palette current and the limited edition Liberty range is - let's be honest - to die for. Essential kitchenware for everyone: a cake slicer and a set of cake forks. And I mean essential. These stainless steel sets are worth the investment for the perfect tea time spread. And on that note - cake! 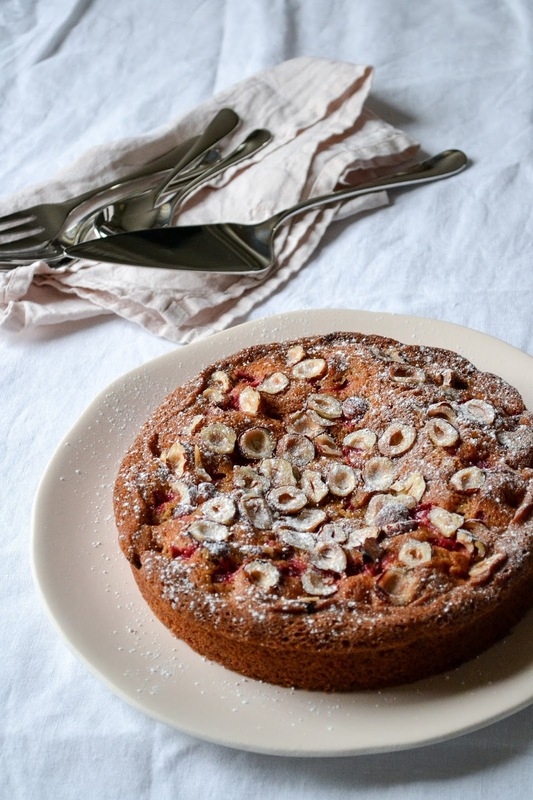 This cake is so easy to whip up and is perfect for teatime. Cobnuts are one of my favourite autumnal ingredients. They have a wonderfully intense flavour which works beautifully in sweet and savoury recipes alike. Swap the blackberries for raspberries, currants or slices of mirabelles, greengages or early season pears. Heat the oven to 170°C and line the base of a 7" cake tin with a disc of baking paper. Butter the sides of the tin. Roughly chop the cobnuts, then set aside. Place the butter, caster sugar and dark brown sugar in a bowl and cream together until pale a fluffy. Beat in the eggs, mixing well after each addition. Sieve in the flour, baking powder and salt, and fold to combine. Add the blackberries and stir through. Spoon the mixture into the prepared cake tin, and level with the palette knife. Top with the cobnuts, then baking in the centre of the oven for 20-25 minutes, until a skewer inserted into the centre of the cake comes out clean. Allow to cool in the tin for 10 minutes before transferring to a cooling rack. This post was written in affiliation with John Lewis, but all views are - as always - entirely my own. 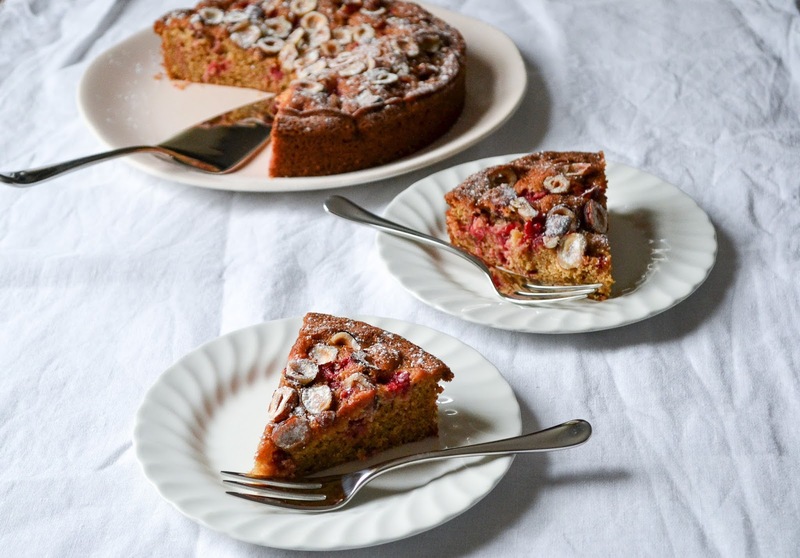 This recipe looks gorgeous - perfect for those autumn afternoons where tea and cake is a must!